West Brom arrived in Blackpool full of confidence and within half an hour, down to nine men, you would have thought that confidence would gradually ebb away. Not so. West Brom were superb all night, patient, disciplined and worked with 9 men better than their hosts with eleven. West Brom will take away great confidence from the performance and have given Roberto Di Matteo plenty to learn from, whilst Blackpool just confirmed what Ian Holloway stated before the game – they need to take their chances. It wasn’t that Blackpool couldn’t create chances, they could, twenty six of them in total. However, for long periods of the game, they were being out manouvered by the nine men of West Brom who created a decent amount of chances themselves. 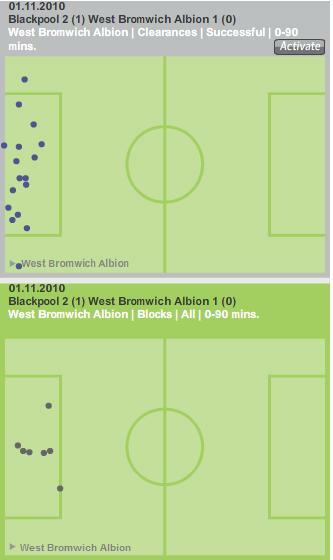 In the period when the game was down to nine verses eleven West Brom managed to get ten attempts away, of those 2 hit their target and one other found the back of the net. Blackpool only managed one more chance on target in addition to their goals. You can speculate about the reasons behind such a poor conversion rate on a night when the uninitiated may have expected a hatful, but when you start to unpick the chances that Blackpool had the true extent of the story becomes clear. Why couldn’t Blackpool break down nine men? I want to look at this in a little bit of detail. To do this I shall take up the story from the previous paragraph. Looking at the chances that Blackpool had in the game then the facts are like this…. Two things can be said here, Blackpool failed to find the target with the chances they had, but West Brom defended superbly to block seven times which is a tremendous defensive effort. But what of those off target attempts? 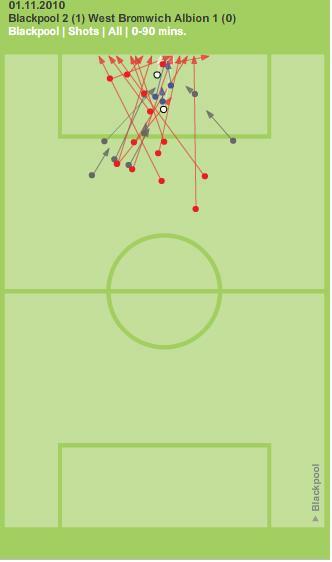 When looking at the chalkboard then it becomes clear that the chances Blackpool were missing weren’t always close encounters, only five of those missed chances came from within the box and only two of the blocks occurred inside the area. This goes along way to show that Blackpool struggled to work the ball in to sufficient enough areas to create genuine goal scoring opportunities. This appeared to stem from a lack of midfield invention and more importantly an over reliance on attacking from the left. I will cover the issue of left in more detail later on as it was pin pointed by Zonal Marking as one of the traits of the game and I want to look at why that was the case. All night long there was a hint of ‘not sure what we do against nine men’ about Blackpool. 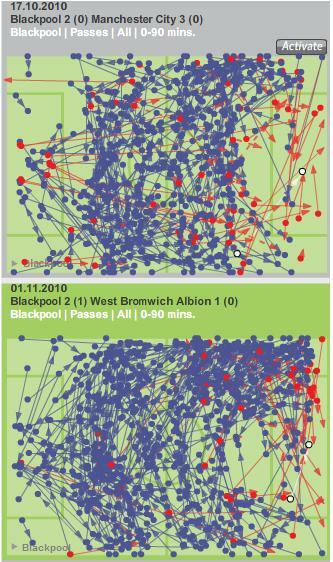 Blackpool appeared to try and work the ball about, but mistakes came very often and very few successful passes found their way to players in the box. If you look at Charlie Adam’s open play passing performance you can see that he made one successful pass in to the box in the tenth minute that lead to the penalty. Adam's only pass from open play in to the box is circled in red, it lead to the penalty and the first goal. A good few fans leaving the ground felt that Adam was wasteful in possession and looking at his stats for the night then his pass completion was 79% compared to 87% against Man City so that has some credence. 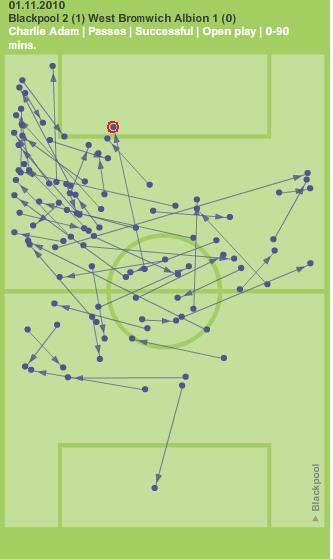 However, approx half of his unsuccessful passes came as crosses and this leads on to the next problem that Blackpool had. Poor crossing. This is something that failed us against Blackburn the other week and again this was problematic. Blackpool hit thirty crosses and only nine hit their target. The crosses were often slow in coming and very predictable due to their prominence in being hit from the left. Often the crosses were hit high, but where is the height in the Blackpool attack to win the headers? Luke Varney won Blackpool’s only header in the box all night. Great credit must go to West Brom, they played two banks of four when down to nine men and stifled Blackpool’s attacks and constructed good attacking opportunities of their own. They defended well and you can see how many blocks and clearances they made in key areas below. The thing that stood out to everyone in the match was Blackpool’s reliance in attacking down the left and I want to understand why this was as Blackpool’s second came from the right. Normally such a bias could be attributed to the fact that there’s more success coming from that area. However, that wasn’t the case. You could point to the fact that Blackpool have two left footed midfielders, so perhaps they favour the left hand side for attacking. Perhaps so, however, that can’t explain it all as you could argue that as a left footed player opens themselves up to a pass then the right becomes a more natural way of hitting the ball. Attacking down the left might be tactical, perhaps, the opposition have a weak right side, but why would that be the case in almost every match that Blackpool play. The passing pattern against Man City was similar (see the chalkboard below) and as mentioned in the season catch up this was the main area of attack against Liverpool. So perhaps this would suggest that it’s not match specific and something to do with the fabric of the team. When looking at the average positions for last night you can see that Gary Taylor Fletcher held a deeper position in the field of play than Varney (the man on the opposite flank). It seems that Taylor-Fletcher does drift in to a more central and deeper role at times and in doing so, when the team looks to attack, if he’s not in the wide right position and Varney is, then naturally the team will seek to go down the left. However, this may be due to the team’s perception that Varney offers a more direct threat than Taylor-Fletcher and gravitate towards him. This positional drift intentional or not may well be the reason for such a focus on the left and if Blackpool are to progress in the Premier league then they need better balance of attack. Taylor-Fletcher unlined in pink and the pink dot is the suggested area he may well have assumed if he didn't drift deep and to the centre. Blackpool ended the night with another three Premier league points and West Brom emerged with a performance that will stand them in good stead during any future adversity. Blackpool knew before the game that they needed to start to convert their chances and that hasn’t changed, however, they need to start to add more variation and perhaps those chances might just become more convertible.